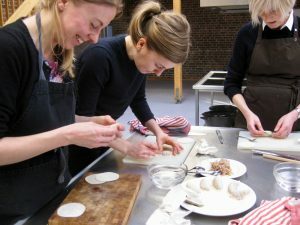 Learn to cook delicious Japanese dumplings, cold seafood salad and salmon as Japanese sushi chef. Classical Japanese dumplings also called gyoza, which can be served as an appetizer or a starter. Fresh Japanese noodles, tasty seafood, crispy vegetables and an aromatic Japanese dressing that gives the final touch. Denmark’s most popular fish cooked in a classic Japanese style and is served in a soy dish served with a vegetable dish. You get an introduction to classic Japanese dishes that are tasty and tender and fit into a busy day. You learn to use Japanese ingredients such as mirin and cooking items which have a firm place on the shelf of Japanese sushi chefs. You learn to buy fish, meat, vegetables and Japanese produce as Japanese chefs. You are working on preparing fish, meat and other materials using techniques such as marinating, blanching and trimming. You work with different Japanese cutting techniques in cooking dishes with different fish, meat types and vegetables. Step by step, you learn to prepare 3 aromatic and tasty dishes such as Japanese dumplings, a noodle dish with seafood and a dish of Teriyaki salmon. One of the dishes was also served as staff food to the 3-star Michelin restaurant Geranium. You make 5 Japanese dumplings, a cold noodle salad with seafood and a dish of Teriyaki salmon that you bring home. Sunday 24 March 2019 from 3:00 to 5:00 at Nose2Tail, Flæsketorvet 13A, 1711 Copenhagen V, Denmark. Price per participant: 605 DKK.